North of Wall Street, Broad Street continues onto Nassau Street. The two southernmost skyscrapers in Manhattan are 1 New York Plaza on the west side of Broad Street, and 125 Broad Street on the east. 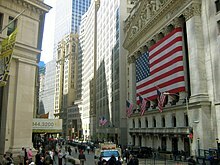 The famous neo-Roman facade of the New York Stock Exchange and its main entrance is located on 18 Broad Street. Opposite it is the former J.P. Morgan headquarters 23 Wall Street and 15 Broad Street, which has been converted into a luxury condominium. Other buildings of note are the Broad Exchange Building at number 25, the Continental Bank Building at number 30 and the American Bank Note Company Building at number 70. The Broad Street station (J and ​Z trains) of the New York City Subway is located at the corner of Broad and Wall. ^ a b "Old buildings of New York City: With some notes regarding their origin and occupants". New York: Brentano's. 1907. Retrieved September 23, 2009. ^ "Lovelace's Tavern: Early New York History, Under Foot". The Bowery Boys: New York History. Retrieved 15 September 2014. ^ Baugher, Sherene; Wall, Diana Dizerega (1997). "Ancient and Modern United". In Jameson, John H., Jr. (ed.). Presenting Archaeology to the Public: Digging for Truths. Walnut Creek, CA: AltaMira Press. pp. 119–121. ISBN 978-0-7619-8909-7. ^ "Forgotten Tour 17, Lower Manhattan". Forgotten New York. Retrieved 15 September 2014. ^ Michelle Nevius; James Nevius (2009). Inside the Apple: A Streetwise History of New York City. New York: Free Press. p. 38. ISBN 978-1-4165-9393-5. ^ "Heroes of Ground Zero. FDNY A History". Public Broadcasting Service. Archived from the original on May 3, 2015. Retrieved December 11, 2015. ^ Rines, George Edwin, ed. (1920). "Fraunces' Tavern" . Encyclopedia Americana. ^ "Southern District of New York 225th Anniversary". history.nysd.uscourts.gov. Retrieved 13 April 2018. ^ Asbury Dickens, A Synoptical Index to the Laws and Treaties of the United States of America (1852), p. 386. ^ U.S. District Courts of New York, Legislative history, Federal Judicial Center. ^ Terry Golway, So Others Might Live: A History of New York's Bravest, Basic Books, 2002, pp. 80-84. ^ "The Great Fire -- Additional Particulars,"New York Daily Tribune, July 22, 1845, page 2. ^ The Draft Riot In New York City 1863 Part III: The New York Draft Riot. From the History Box website. ^ a b Metropolitan Police: Their Services During Riot Week. Their Honorable Record. By David M. Barnes. ^ Sobel, Robert (13 April 2018). "The Curbstone Brokers: The Origins of the American Stock Exchange". Beard Books. Retrieved 13 April 2018 – via Google Books. ^ a b c d e f g h "Asks Bingham to Oust Curb Brokers; Lawyer Allen Says Open-Air Exchange Is a Public Nuisance and Therefore Illegal. He Cites Many Decisions And Will Press His Contention -- Brokers Forced to Move Many Times Owing to Complaints". The New York Times. New York City, New York. August 17, 1907. ^ a b E. Wright, Robert (January 8, 2013). "The NYSE's Long History of Mergers and Rivalries". Bloomberg. Retrieved April 10, 2017. ^ a b "The New Stock Exchange". The New York Times. February 22, 1877. Retrieved April 10, 2017. ^ "The Ketchum Forgery; Additional Particulars Yesterday's Developments". The New York Times. August 18, 1865. Retrieved April 21, 2017. ^ a b "The Mills Building", The New York Times, February 3, 1882, pg. 8. ^ "34-Story, $12,000,000 Structure to Replace Mills Building, First Wall Street Skyscraper", The New York Times, January 16, 1925, pg. 1. ^ Chase, W. Parker (1932). New York: The Wonder City. New York City: Wonder City Publishing. p. 161. ^ Edmonston, Peter (April 28, 2006). "Where Wall Street Meets to Eat, the Last Lunch". The New York Times. Retrieved January 29, 2009. ^ "IN THE REAL ESTATE FIELD; Four Per Cent. Loan of $3,450,000 on Broad-Exchange Building -- Sale of 115th Street Properties -- Dealings by Brokers and at Auction". 31 August 1909. Retrieved 13 April 2018 – via NYTimes.com. ^ "National Historic Landmarks Survey, New York" (PDF). National Park Service. Archived from the original (PDF) on 20 June 2007. ^ ""Curb" Wars on Swindlers; Ready to Investigate Any Stock Brokers of Whom the Public Complains". The New York Times. New York City, New York. November 11, 1909. Retrieved April 21, 2017. ^ a b When Stocks Came in From the Cold (September 30, 2010). "Christopher Gray". The New York Times. New York City, New York. ^ "Mendels at the White Inquiry; Hughes Investigators Take Up Conditions in the Curb Market". The New York Times. New York City, New York. February 27, 1909. p. 13. Retrieved April 21, 2017. ^ "Father of the Curb Dead; Emanuel S. Mendels, Jr., Elevated Trade and Routed Dishonest Brokers". The New York Times. New York City, New York. October 18, 1911. p. 11. Retrieved April 21, 2017. ^ "23 Wall Street", Time Magazine (September 24, 1923); accessed 15 March 2010. ^ "E.M. Fuller & Co. Fail". The New York Times. New York City, New York. June 28, 1922. Retrieved April 18, 2017. ^ a b "City Investing Co. Buys Skyscraper in Broad St". The New York Times. May 20, 1943. ^ "Old Realty Records on Broad Street; Continental Bank Site Once Owned by Dutch Church – Almshouse There in 1659". The New York Times. October 25, 1931. ^ "Cushman & Wakefield, Inc.". International Directory of Company Histories. encyclopedia.com. 2007. ^ D. McFadden, Robert (1989-12-16). "SoHo Gift to Wall St.: A 3½-Ton Bronze Bull". The New York Times. Retrieved 2007-10-01. ^ a b Mcfadden, Robert D. (1989-12-16). "SoHo Gift to Wall St.: A 3 1/2-Ton Bronze Bull". The New York Times. ISSN 0362-4331. Retrieved 2017-04-13. ^ The Associated Press (1989-12-20). "Wall St.'s Bronze Bull Moves 2 Blocks South". The New York Times. ISSN 0362-4331. Retrieved 2017-04-13. ^ Wakin, Daniel J. (May 23, 2011). "City Opera Departure Brings Questions". The New York Times. ^ Wakin, Daniel J. (December 6, 2011). "City Opera Leaving Lincoln Center". The New York Times. ^ "'Money Monster' reshoots happening in NYC this week". On Location Vacations. January 19, 2016. Retrieved January 26, 2016. Wikimedia Commons has media related to Broad Street (Manhattan). This page was last edited on 30 November 2018, at 07:52 (UTC).